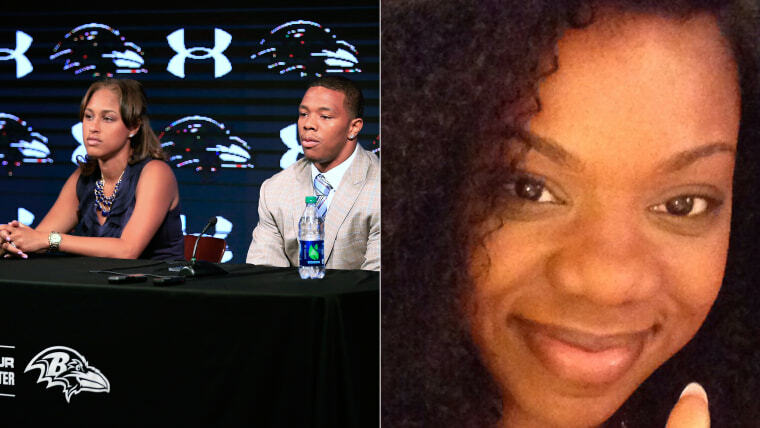 Beverly Gooden, who says she herself has been a victim of domestic violence, was stunned by criticism she saw leveled this week at victims of domestic violence, following the release of disturbing footage in which NFL player Ray Rice is seen assaulting his now-wife Janay Rice in an elevator. Gooden took to Twitter to share her own story and encouraged others to share theirs, launching the hashtag #WhyIStayed. In this essay for TODAY.com, Gooden pens a letter to herself (and other victims of domestic abuse), addressed to "the me who stayed." I’m sorry that he broke his promise to you. You believed that last time was the last time, and why wouldn’t you? Most people want to believe the love of their life. Yes, that’s right. I know you still love him even after he choked you. It’s ok, you can say it. You love this man. You feel lost without him even though you are afraid with him. It’s a strange feeling right? To love a man so deeply and to fear him, just as deeply. You can feel those emotions. You can feel whatever it is that you’re feeling. You don’t owe anyone an apology for your feelings. I understand why you stay. The way he holds you after an altercation? It feels so good. The negative touch followed by a positive touch… it warms you. It makes everything better. Well, everything except the bruises. And he takes care of you! No man has ever taken such good care of you. He protects and provides. He adores you in public. His smile is so amazing. You feel lucky to have landed such a catch. A lot of girls liked him, and everyone at church speaks highly of him. But he chose to spend his life with you. So you refuse to let him down. When he focuses all his attention on you, it’s exhilarating. You are the center of his world! Maybe even a little too much. Every move you make is criticized. He just wants you to be better, right? He tells you that you are the only person that can bring out that side of him because he loves you so much. See, you get under his skin because you are the one he cares about. Isn’t that wonderful? To be cared for so much? What woman wouldn’t want to be a man’s whole universe? Only that doesn’t really make sense. His boss gets under his skin, but he’s never hit her. He wants his sisters to be better, but he doesn’t bite or push them. Things aren’t adding up, are they? Bev, it’s not you at all. There is absolutely nothing you can say; no way you can behave that would be perfect enough for him. It is not you, it is him. He is at fault. But now you’re thinking that those few times a month he gets angry enough to hit you can’t outweigh the 27-28 other picturesque days you spend together making up. Right? Or, could the other 27-28 days simply be borrowed time? It only takes a few seconds to end a life. He could end your life. Our life. You could start planning an escape right now, if you want. It will take some time, but you can do it. It’ll be difficult and you will want to give up. There are resources out there to help you. But be careful opening those links, especially if he is in the house. The choice is yours, Bev. But only when you’re ready, and not a moment sooner. No guilt, pressure, or shame. I can’t say this process won’t ache. You will be sad for a long time. You’ll miss him and the life you had together. You will be afraid for your life. You’ll wonder if you made the right decision by leaving. Feel that; own that hurt. Acknowledging the pain is a necessary step that precedes what I’m going to tell you next. Once the pain subsides, you will experience freedom. Oh Bev, there will be such peace! Can you imagine that? It will feel like heaven. You will build a new career. You will find love again. You will experience healthy relationships. You will make new friends and reconnect with old ones. You will get group therapy and meet other women like you. You will buy a car. You will have food to eat. You will have coffee to drink! You will survive. You will thrive. You will breathe. You will live. We will live. You will have the world at your fingertips. When you’re ready, the world will be too. You can find more from Beverly Gooden on Twitter here, and on her website.